Leading Manufacturer of ptu 300 pressure , humidity & temperature transmitters and ptu300 combined pressure, humidity and temperature transmitt from Mumbai. The Vaisala Combined Pressure, Humidity and Temperature Transmitter PTU300 measures barometric pressure in two accuracy classes, humidity, and temperature. You can choose which probe best suits your needs: PTU301 for laboratories, PTU303 for outdoor use, the warmed PTU307 probe for demanding meteorology, and PTU30T for pressure and temperature only. 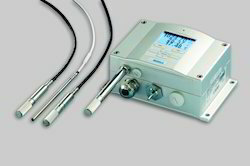 The PTU300 transmitter uses sensors known for their high accuracy and excellent long-term stability: the Vaisala BAROCAP® is used for pressure measurement and the Vaisala HUMICAP® for humidity measurement. The temperature sensor is a platinum RTD sensor. The PTU300 series features a large numerical and graphical display, allowing users to easily monitor operational data, measurement trends and 1-year measurement history. The optional data logger with real-time clock makes it possible to generate over four years of measured history, and zoom in on any desired time or time frame. The battery backup of the real-time clock guarantees a reliable logging of measured data. The recorded measurement data can be viewed on the display or transferred to a PC with Microsoft Windows® software. The transmitter can also be connected to a network with an optional (W)LAN interface, which enables a (wireless) Ethernet connection. A USB-RJ45 cable makes it easy to connect the service port of the PTU300 to a PC. PTU300 is also capable in applying the MODBUS communication protocol and together with an appropriate connection option provides either MODBUS RTU (RS485) or MODBUS TCP/IP (Ethernet) communication. A quick, one-point field calibration for humidity can easily be done using the Vaisala Hand-Held Humidity Meter HM70. The PTU300 comes with a standard RS-232 serial interface. The output format is compatible with major GPS receivers and NMEA coded messages. RS-485 is available as an option. The optional HMT330MIK Installation Kit is available for outdoor installation. It provides reliable measurements for meteorological purposes..